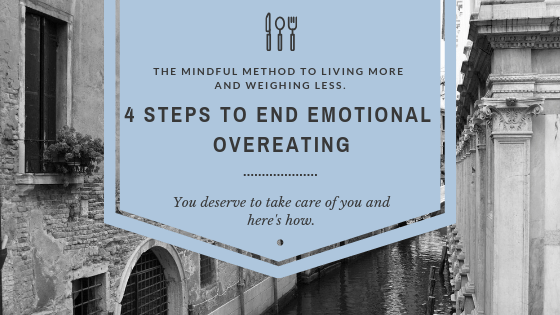 Four steps to end emotional overeating | Kasia Keenan | Weight Loss Life Coach I want to talk openly about what is one of the biggest reasons for your extra weight. Today, I want to talk openly about what is one of the biggest reasons for your extra weight. It’s emotional overeating, and I’ll be sharing my 4-steps to help you end it. To begin to unravel and understand, let’s define it first. Emotional overeating: eating for any other reason outside of real physical hunger whether conscious or unconscious. I believe that women turn to it with the best intention of self-care at the moment, but it’s only temporary and does not support your long term goals for physical and mental health. “What gives? Why do I keep doing this to myself?” you say to yourself. It’s your buffer from not having to feel the uncomfortable feelings you are having. But because it’s only temporary, the unresolved feelings are still there along with additional physical weight. Why? Food solves for physical hunger. When you are not hungry, food will not be the long term answer. Sometimes taking a step back allows for you to see things clearly for what they are. So let’s break it down, shall we? First, of, a feeling is a communication that you receive from your thinking whether conscious or unconscious. So the best that can happen is a vibration in your body, and the worst that can happen is a vibration in your body. That’s it. And every time you run to the fridge while not physically hungry, you are experiencing something uncomfortable. But if you haven’t paused to take a look at it, you are buffering over the feeling and over the thought that is causing the feeling. Some of you might be thinking, heck yeah that’s what I’m doing. I don’t want to be uncomfortable. Here’s the deal, when you do that, it’s still 100% there. It piles up. It distracts you from addressing your thinking and feeling to see what’s underneath. It’s like having a messy closet and turning out the light. Just because the light is out on the mess, it doesn’t mean that the closet is not dirty. But when the light is turned on, and you get to examine the mess, you then get to decide what you want to do about it or not from a place of really seeing it. Same goes for your feeling and thinking, when you become aware of what you are feeling and what thoughts are causing it, you can then move through and see what you want or don’t want to do about it. 1. Pause and become aware from an observer perspective. Notice when you have the urge to eat or overeat when you are not physically hungry. 2. What feeling do you want to avoid? 3. Give it a name and locate it in your body. Describe it in as much detail as possible. I want you to know beautiful, that I believe in you and that you can do the hard things in life by feeling the good, the bad, and the ugly. They will not kill you, and in the process, you’ll start to nurture and take care of yourself as you deserve. That’s the ultimate act of self-care you can give to yourself is to show up for yourself and no longer hide from what your ‘real’ self is trying to communicate to you.